We are very pleased to be able to offer another book that contains Pine City area history. Order a copy. The History Association sponsors a weekly discussion on local history. Learn all about it in this video. Join us as Jim Foster looks back at the logging industry in Pine County. The public is always invited and encouraged to bring items related to the topic to share. Memberships will be available for purchase. For more information call 320 322 9208 or email pcahistory@gmail.com. Read about a past general meeting; "Rural Schools"
Read about a past general meeting; "History Rocks"
Read the daily diary entries of Carl E. Meier 1940 - 1944. Carl's grandaughter, Darcy Pinotti's wonderful scans of Carl's daily entries, coupled with photos and a comprehensive index, make this book a treat for the casual browser or the serious reader. We are so pleased Darcy shared this book with us. In the summer of 2015 we brought the Privy Diggers to town. Here is a video of one of the digs. The Privy Diggers were here in Fall 2016. You can see some of their finds on our Facebook page. Explore Pine City area history at our interactive iPad kiosk. Using touchscreen technology, read old Pine City newspapers, look through phone books from the past, explore maps, photos and more. Made possible by a grant from The Royal Bank of Canada and an Operation Round Up grant from East Central Energy, this kiosk makes Pine City area history accessible in a whole new way.The kiosk is located in the Chamber of Commerce office in the Pine Government Center. Monday - Friday 8:30 to 2:30, Free & open to the public. The history association is pleased to share two new brochures. The history association is funded by memberships. 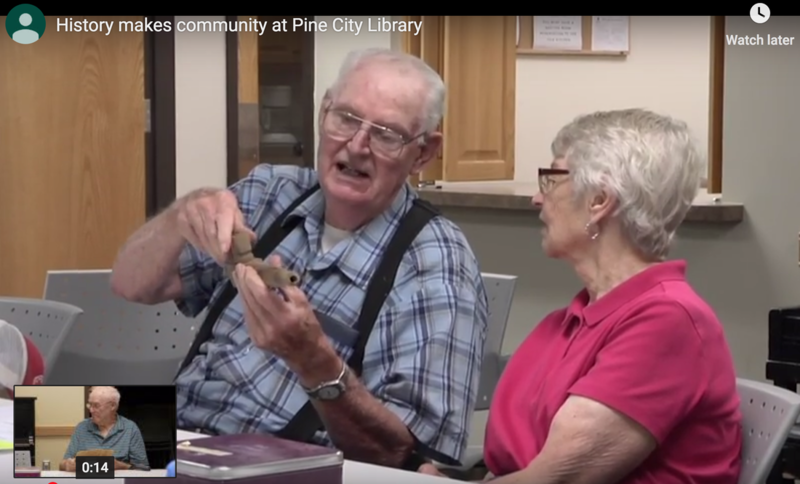 The public is encouraged to become a member of the Pine City Area History Association. An individual/household membership costs $20.00 and is valid for one year. You may purchase your membership by mail. Complete the membership form and drop it in the mail.